The flat Has Been designed to enjoy this fascinating place to forget the metropolitan chaos and to revive the ancient glories of ancient Rome. 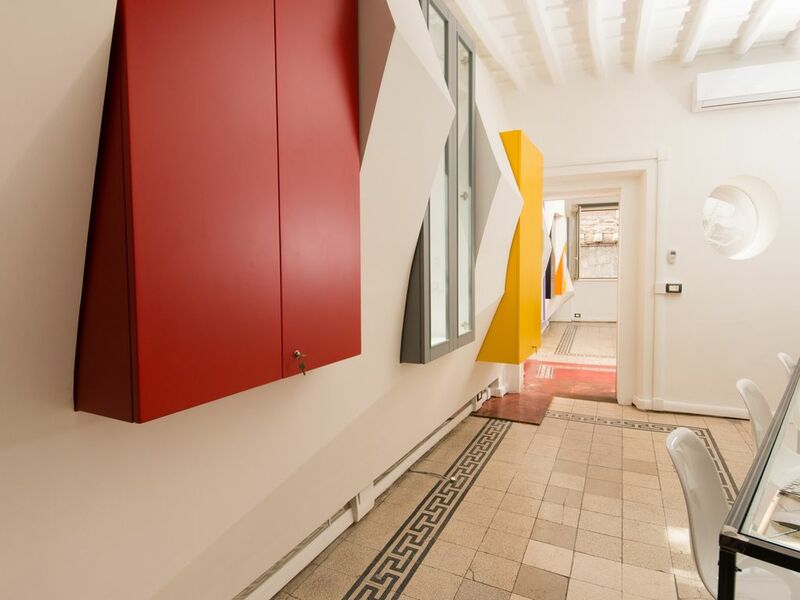 It can comfortably accommodate 2 people at about 20 meters from the Pantheon. The apartment has a pictorial vision of architectural space inspired in the work of the master color of the Russian Suprematist Malevich. Inside it feels a shift of the two dimensions, from paintings of Russian Master to the three dimensions of the architectural object. The breakdowns adopted strongly highlight intensity and direction of the various inclined planes that become balanced. The work transforms the unconscious and the pictorial consistency of Architecture Designs that in turn contain information and instructions to create three-dimensional models. The only issue we had was the 4 flights if steep stairs to get our luggage to the apt. The owner mentioned getying a lift this year...in which case we would definitely return again!! Beautiful flat that was exactly as the pictures. We stayed here for our 5 year wedding anniversary. The front window of the apartment is directly facing the pantheon and is in close proximity to every amenity. Our host Laura was excellent and gave us several recommendations in the area which were spot on. Would stay again for sure! Thanks Mark for your stay, it was very pleasure know you! L' appartement de Laura est situé au 4 ème étage d'un bel immeuble ancien en face du Panthéon. Le lit est positionné en face de la fenêtre donnant sur le Panthéon.très belle vue éclairée de nuit sur le Panthéon.Les photos du descriptif sont exactes.L'appartement, en longueur n'a pas de porte qui ferme entre la chambre/salon et la cuisine. Il y a dans la cuisine une porte fenêtre donnant sur un mini balcon très fleuri très agréable. Les - : pas d'ascenseur , escalier pentu donc voyager léger. Nous avons passé un séjour inoubliable dans cet appartement parfait , à recommander absolument pour 2 personnes.